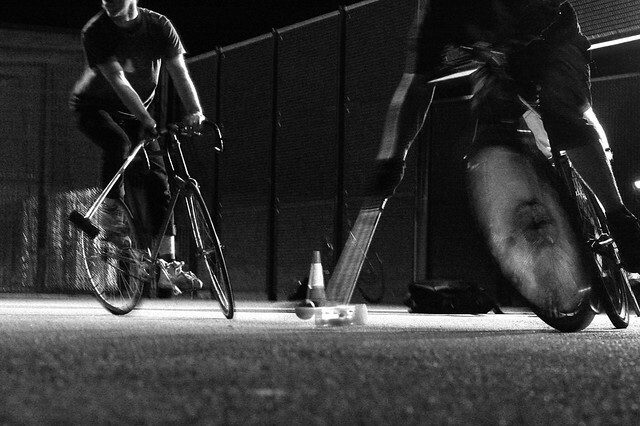 Polo is now starting at 8pm until further notice | Birmingham Hardcourt Bike Polo, UK. It’s officially Autumn and we’re losing our light much earlier in the day. I hate this. Despite the earlier onset of darkness, for some odd reason the council haven’t sent anyone out to adjust the timers on the court’s floodlights. As a result the lights don’t switch on until well after the sun has gone down and it’s too dark to play. Perhaps they’re trying to save money on electricity or perhaps it’s just not on the top of their list of priorities. Whatever – the thing is that it means polo will now be starting at 8pm. Get thyself down to Calthorpe park and have a go! It’s a friendly game that’s been described as the “most fun that can be had on a bicycle” and, if you’ve never been before, we’ll lend you a mallet and introduce you gently. See you on Wednesday then? Is Polo go for tonight?